Proper error handling is the bane of the developer’s existence, for errors are both visible and marginal. Errors are visible in that the user sees them. They are marginal in that they are part of "infrastructure;" error handling is a technical problem, and not a business priority. The marginality of error handling means that the "business case" for error handling is weak, since a heavy duty error handling scheme is to a manager with an MBA from a good school, a market failure. Unlike programmers, people who are fiduciaries of companies—that is, people with direct responsibility to the bottom line—generally seek ways to quantify risk, and this is usually using an insurance or hedging model. They don’t like to see elaborate error handling in cases where this cost hasn’t been externalized into a customer demand for elaborate error handling or even a software risk insurance policy which states, "we underwrite on condition your programmers do thus and so in error handling." But this externalization of costs leads to a further problem: as soon as the business requirements get spelled out in detail the question arises to why they need to be in effect rewritten as code. 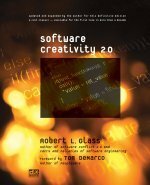 This, in turn, takes us back to the central issue of programming: its necessary marginality as a form of writing, supplementary to the specification. But that is a large theme; let us focus on error handling. To leave error logging, notification, and display to the highest level tier. To avoid elaborate recursive error handling of errors within the error handling, a tricky and in some cases desperate business. To add value to the error message where possible, and to Throw or otherwise pass the error message to the next higher level of error handling. To never "lock down" the code to any one vision of error handling. To add value in part by conscientiously decorating the message with highly structured information, including the date, the time, the class from where the error emerged, the object instance from where the error emerged, and the type of the error (see below). To provide at least the option to write the decorated error to a system log. Critical errors: errors where the software discovers a program bug. For example, the default "not supposed to happen" case in a select case statement should raise this type of error. The object should put itself out of commission. In the Level group box, click all the radio buttons to see the result of the errorLevel2Explanation() procedure (see documentation later in this article) refresh the screen with the explanation of each level. Therefore, System.Exception is followed by the meaning of the radio button selected as the Level of the error: criticalLevel. This is followed by the source of the error: myObject.myProcedure(). This is followed by the date, time, and the body of the error message. A line break is followed by the full help advice which consists of help text, the errorLevel2Explanation explanation of the error, a blank line, and finally the action you identified. The blank line appears because errorHandler accesses Microsoft.VisualBasic.Err.Number and Err.Description. If Err.Number is zero and Err.Description is a null string, a blank line appears, otherwise these values are displayed. You may want to remove the code that displays Err.Number and Err.Description. This is because using them increases your dependence on Microsoft.VisualBasic as a library. This library is full of "legacy" code which doesn’t in all cases work smoothly in Web Services and as a general rule, VB.NET code should migrate away from it. The help advice lines are followed by the rest of the Exception.ToString() text, which provide the source of the error. As shown above, because strEventLog was included, an event was added to the Application log. Try the errorHandler out to see if it meets your needs and that of your team. The following directories and files are available, containing the errorHandler and its test application. 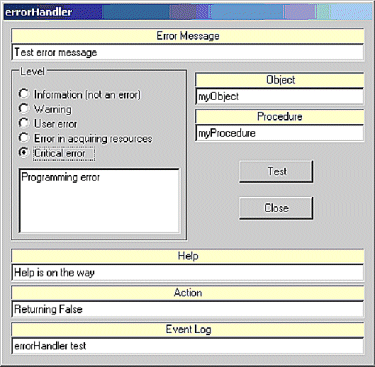 ErrorHandlerTest: directory containing the errorHandler test application, containing ErrorHandlerTest.SLN, ErrorHandlerTest.PROJ, and Form1.VB. strMessage is the only required parameter of errorHandler() and it should describe the message. There’s an art to composing an error message, of course, and errorHandler() can’t prevent you from composing a bad one. In general the message should avoid blaming the user who unlike the programmer is usually scared of error messages. The remaining parameters are all optional in the sense of overloads-optional. 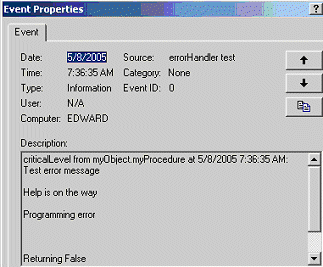 enuLevel is the error level as described above. criticalLevel: a programming error has occurred. informationLevel: not an error: but we need to provide some information using the error handling system. resourceLevel: an object cannot get the resources it needs from the system to operate properly. In .Net, for example, this would be any failure to create a reference object (other than Boolean, Byte, Short, Integer, Long, Single, Double or String), which needs storage in the .Net heap. userLevel: the object user has supplied invalid data, typically as a procedure parameter, such that the request made cannot be honored, but the object itself is OK.
warningLevel: there might be a problem, but probably isn’t. strObject should identify the object producing the error...not its class. Ideally, you’ve named each class instance using a method I will fully describe in a subsequent article, where the name includes the class name, a sequence number, and the date and time. However, something like classname instance is perfectly acceptable for short-term use. It identifies the class, but makes it clear that an instance produced the error. strObject defaults to "Unidentified object." strProcedure should identify the "procedure" which in VB.Net identifies either the method or property, generating the error. strProcedure defaults to "Unidentified procedure." strHelp can be a long or short string with long or brief help information. There doesn’t seem to be much point in subordinating an elaborate "help" system to the errorHandler which to be reusable interface needs to be light in weight and in spirit, and you can, if you like, get the help information from another subsystem and pass it, if it is of reasonable size, as a string. strHelp defaults to a null string because it looks unprofessional to default to "Help is not available." There’s a public service ad on Hong Kong TV which advises people working in shops never to say "no" in such a way as to make the customer feel as if she’s undeserving of help. strAction should identify what is being done in response to the error condition. It’s a separate consideration from help information. It defaults to a null string. strEventLog when present and not null causes the error to be logged (with its full "decoration" including date and time) using System.Diagnostics.EventLog.WriteEntry() with two parameters: strEventLog and the fully decorated message. On a Windows system, this adds the message with decoration and new-lines to the Application log which can be viewed by right-clicking My Computer on the desktop, opening Manage, opening System Tools and Event Viewer and clicking Application. One problem throughout this short and simple class is its exclusive use of English, but for ease of modification, the error level explanations are symbol constants, and not strings. 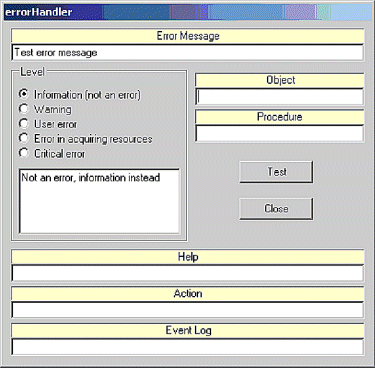 The errorHandler project, including demonstration and reusable DLL, can be downloaded from this link.